Sage Bhringi was a great devotee of Shiva but he refused to accept Mata Parvati as a Goddess. He never offered prayers to Mata Parvati and this infuriated her as she was the Shakti – the female energy. The sage performed circumambulation of Shiva daily but ignored Parvati. Then Shiva and Parvati appeared in the form of Ardhanarishvara to provide realization to Bhringi. The sage realized that although Shiva and Parvati appear as two different bodies but they are in essence one – the source of all creation, sustenance and dissolution. 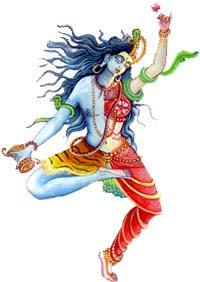 Shiva and Parvati appear as two different bodies to those who are under the influence of Maya. For those who have attained self realization they are in essence one – the source of all animate and inanimate. Creation, sustenance and dissolution take place in that primordial source.